Chinese film actress, Li Bing Bing (李冰冰) attended 20th Annual Elton John AIDS Foundation Oscars Viewing Party held on February 26, 2012 in Beverly Hills, California. She walked the red carpet along with designer, Lana J. Marks. Wearing a royal blue lace dress with Swarovski crystal embroidery from Alessandra Rich Spring/Summer 2012, accessorizing her look with a belt and a customized Lana Marks clutch. 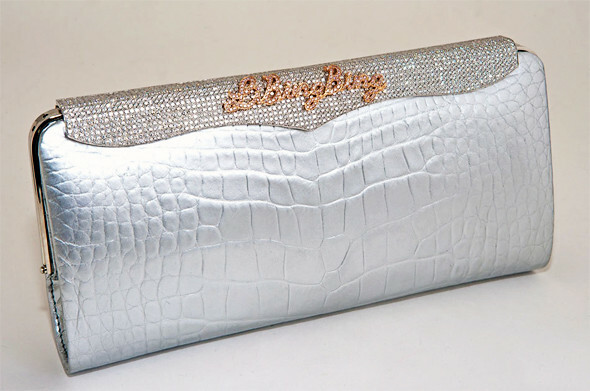 The clutch is made of white Louisiana alligator skin, handcrafted with 40 carats of white diamonds. Li Bing Bing (李冰冰)'s name was rendered in pink diamonds.